CYLAND Media Lab is one of Russia’s most active New Media art nonprofit organizations. CYLAND houses the largest archive of Eastern European video art online, organizes exhibits around the world and is the force behind CYBERFEST (Russia’s largest annual New Media art event.) CYLAND was cofounded by Marina Koldobskaya and Anna Frants. Centro Studi sulle Arti della Russia (CSAR) is the first university center in Italy which aims to carry out systematic research and dissemination of the cultural heritage of Russia. Its activities include permanent and temporary workshops, international conferences, film festivals and supporting Performing Arts. 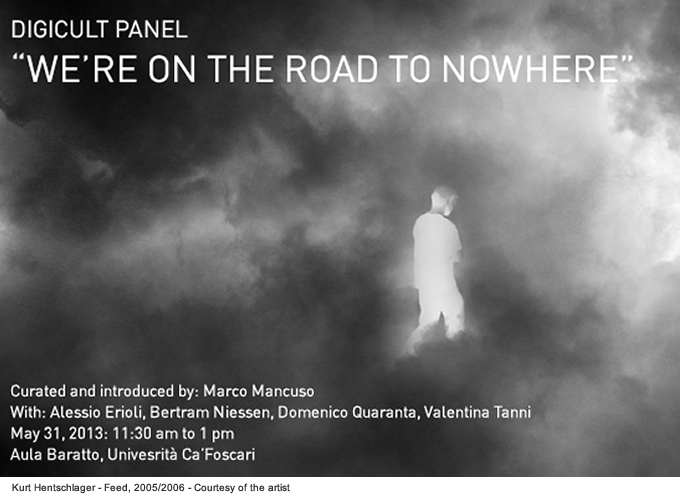 CYLAND Media Art Lab (St Petersburg, Russia) & Centro Studi sulle Arti della Russia (CSAR), Ca’ Foscari University in Venice, togheter with Digicult presents a panel curated and introduced by Marco Mancuso with the partecipation of Alessio Erioli, Bertram Niessen, Domenico Quaranta, Valentina Tanni. We are on a road whose final destination is unknown. We can barely distinguish its edges, its borders, its rules of travel. But in the end we do not care that much. We are jauntily adapting our professionalism, our interests, our fields of research and analysis, in order to understand the complexity of contemporaneity. We are not worried, we are not confused. We observe art, culture, markets, design in our Information Age, envisaging future scenarios and comparing them with past experiences, noting overlapping elements between disciplines, materializing in the folds of possible differences between research areas. We are living in a mature age, aware of the social, economic and creative limits of technologies, but also looking at their development and impact on society through a professional and curios perspective. So, we are on a road of inconsistencies, of sudden changes, of at times destabilizing extremes. We live its complexity and are not only keen to analyse it, we try to make it part of our lives and work. We seek to illustrate it through exhibitions, meetings, articles, round tables, readings, educational activities. We are no longer children and we know what we want, we know out of which material our future is made and which kind of technology it will adopt in order to acquire a new shape, a shape which we still do not know. But give us the time to find this out: our curiosity is everybody’s curiosity, and reflects that aspiration to understand the society we live in. Digitally based forms of production and reproduction are disrupting our consolidated ways to think at culture, art, information and science. Each of this sectors is witnessing a phase of continuous and accelerated transformation marked by an increasing of the gap between traditional, institutionalized forms of knowledge elaboration and new collaborative networking practices that are redefining the boundaries of social action. At different levels, this is affecting the notion of society as a whole, producing an increasing segmentation of meanings, common senses, systems of values, believes and behaviors. The talk will depict some of the main development paths for this trend at crossroad between culture and technology. The contemporary framework has finally recognized complexity and emergence as the dominant paradigms of our era as we have finally stepped out of linear deterministic paradigms (i.e. the machine paradigm: man as a machine, Fordist models of society and labor, la machine à habiter, etc. ), and physics of matter put information at the core of our reality. In such framework and with the power to program information not just as abstract but as the constituent part of living matter and direct our own evolution, what consequences and opportunities open for creative disciplines? More than observation and imitation by repetition, there is an urge to call for creative projection: an imagination that does not embraces only the narrative (such as utopian/dystopian visions did so far) but also the aspects linked to processes, costs, information/matter and the energetics involved, joining design and making in a simultaneous, intertwined ongoing process. A common view of the net describes it as a place of relations, interactions and exchanges. This perspective has been translated in software by what is called today “social web”. And yet, the way internet works privileges monologue over dialogue. Identity construction over the development of social relations. In a context in which relations are mediated and happen “out of the body”, as Douglas Rushkoff suggests, the digital identity needs to be constructed, and the data that we circulate in social networks, the relationships we develop therein and the way we manage them, all concur to this process. At the very core of this never ending flow of tweets, likes, reblogs, given and accepted friendships, images and videos there is not the other, but the self. We are not constructing relationships: we are painting self-portraits. We’re living in an age of great changes. The ultimate loss of a definite cultural center – the end of mainstream culture and mass market as we know them – is the final stage of a long historical process, started several decades ago. The splitting of our culture into a collection of tribes is something that might sound scary, but really opens up an ocean of possibilities for knowledge, education and creativity. The biggest challenge we’re facing today is finding the right way to deal with this non stop interaction with diversity and complexity, a new “condition” made possible by the Internet. The available tools are curiosity, creativity and the courage to be different. And in this quest, art can be a useful guide.